For use in Sweetening any situation in your life, whether it be love, money, work or otherwise. This jar is used to influence the energy surrounding your situation and bring sweetness, goodness and luck! It can be used to assist with any kind of relationship, including that with your boss or co-worker. It can also be used to bring sweet vibrations and good flowing-energy to just about any situation, such as finances, work environment or home life. As always, each Service is customized to your specific needs and goals! This Honey Sweetening jar created by Miss Melinda utilizes traditional ingredients such as syrup to add speed and honey to sweeten..... it also includes my own secret ingredients and tips and tricks personal to my practices. Your jar will be packed full of goodness! Lots of strong herbs for love, attraction, and drawing energy. It will also contain dried and fresh flower petals, a whole cinnamon stick for luck and added power, attraction powder, sugar, a paper petition, and more. I love making these and I take great pleasure in adding just the right ingredients to pack extra energy and enhance success! I use the best quality herbs, flowers, and curios to create a powerful, tailor-made Working for your needs and goals. My Honey Sweetening Jars are packed full of herbal goodies and love! In these photos you see just one layer of the detail I put into these. They're one of my favorite things to do, and Selecting the perfect concoction to manifest your goal is my pleasure. 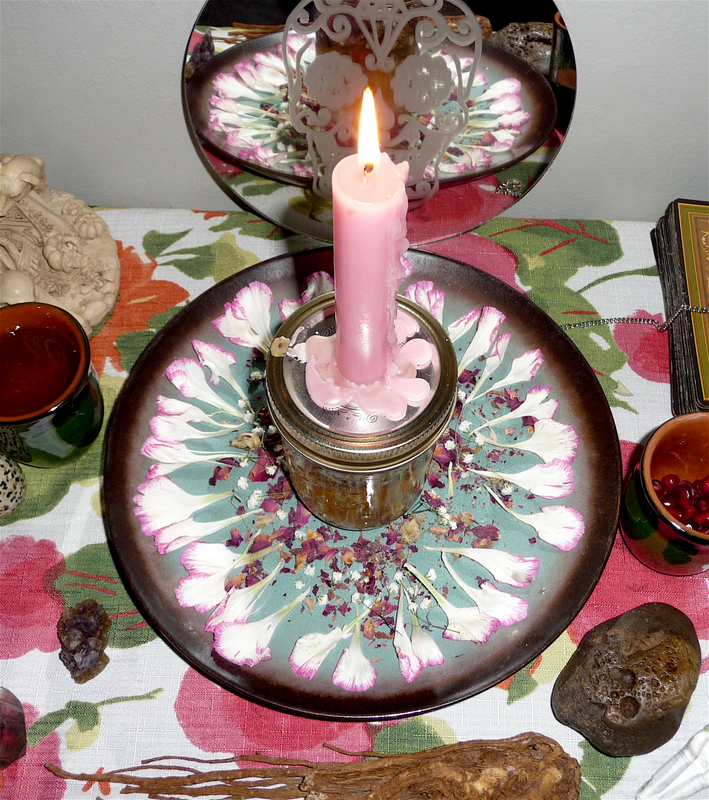 I burn a total of 6 candles on each jar and keep them on my altar for a total of 7 weeks before ritual disposal in a manner and location designed to heighten the power of the Working. Honey has been used since ancient times to attract angelic forces and good luck. Honey jars have traditionally been used in hoodoo to sweeten a situation and bring prosperity. Angel bottles or magic money bottles are common in European witchcraft practices to obtain good fortune and plentiful finances. All Services are written by me and are personal to my philosophies and techniques which have been developed over twenty years of practice. The Saints, Deities, and Spirit guides that I work with will be asked for assistance in these undertakings. When you book a Working or Service with me you will be notified via email with a confirmation and a schedule date. The Work will be performed on the next available day of the week and during the moon phase which works best to heighten the power. You will receive a full, detailed report when your Working or Service is complete. Please comment at the time of checkout indicating your current goal or circumstance with as much detail as you would like. Also include your date of birth and full name. The more information you give me the better I am able to help you. Check out my About Me page for further information. Feel free to message me with questions! Looking for other Money Magick? Check here. Looking for other Love Magick? Check here. "Thank you for this lovely update along with the pictures. I am truly impressed with the amount of time and detail you have included. While I know it is early, I feel so much positive energy. I feel truly blessed by your work. I am more peaceful about things. I am fortunate that I came across you and I look forward to working with you again. Thank you again for your time and sharing your gift." "You put so much work into these, Ive done these before but no one ever showed so much compassion as much as you have." "Thank you so much. Your work is always so beautiful. I've been seeing him a lot more. He seems to be making more eye contact when he says hello. And his stare tends to linger a little bit more, even his smile. Tonight I caught him glancing over at me.. of course he shyly turned around when I caught him. Also he actually liked one of my video's on Facebook and that has never ever happened before, so I was very surprised. He also is a new client at my place of work, that was shocking. Lol. So there are little things that are happening. Very subtle. Once again thank for everything you have done on my behalf. Your so kind and professional. You take the time to answer all my questions and I am so appreciative."